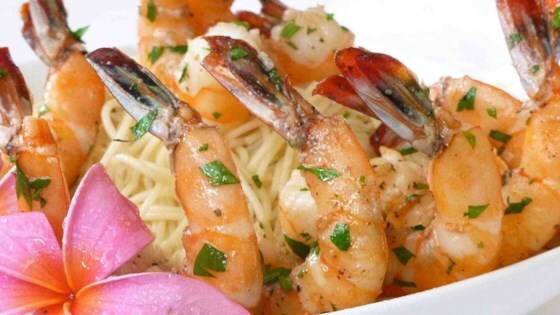 "A simple but elegant shrimp dish. Combine it with garlic bread and a salad for a delicious dinner." A little different than my on version. A step up. I recomend if you wish to cut the fat to use half the butter and a quarter cup of olive oil. The oil also helps to keep the butter from burning. This was a really good dish! It tastes similar to a dish from TGI Friday's. I used 1/2 cup wine and 1/4 cup fresh lemon juice. This recipe is a keeper.